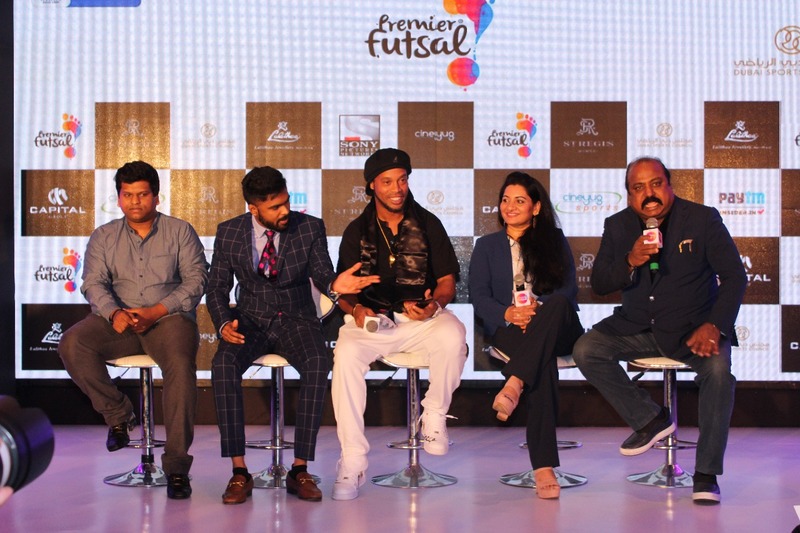 Premier Futsal, the world’s biggest Futsal tournament is all set to further strengthen its position as a sporting league par excellence with Season 2 of the global offering promising to be bigger, better and more engaging than ever. Former Ballon D’or winner and Brazilian footballing sensation, Ronaldinho will set the arena on fire once again as he extended his association with the league by 3 years. Premier Futsal has also collaborated with Dubai Sports Council which takes the tournament beyond the Indian territory with Semi Finals and Finals scheduled to take place in Dubai. With Goa paving way for Delhi and Bangalore as hosts, the geographical representation of the league has now grown to 4 cities, and more than 24 matches spread across two weeks further strengthen its status as the biggest futsal tournament in the world. The futsal extravaganza, beginning 15th September will travel to Mumbai, Delhi and Bangalore before culminating in Dubai with the ultimate battle of Futsal supremacy taking place on 1st October. The six teams will play each other 7 times prior to the semi-finals which will also take place in the port city. All the matches will be broadcasted live on Sony Network. Mediapro, a global leader in broadcast media, marketing and sport has also made its foray in the Indian market with Premier Futsal. The strategic alliance will facilitate and create an intellectual property for Premier Futsal globally. The Spanish company will engage in delivering marketing solutions and services along with the production and distribution for all matches in season two. Dr. Kiran Kumar, promoter of Lalitha Jewellery was also announced as a key investor in the independent sporting venture. Premier Futsal, the world’s largest futsal promotions company is bringing football legends, futsal superstars and home-grown talent on a unique platform in a never-seen-before made-for-TV product. The tournament was broadcasted in United Kingdom, Middle East, Europe, South America and South East Asia regions other than India. Season 2 only promises to be bigger and more engaging with more match days, greater number of host cities and a varied range of global superstars all set to participate in the sporting spectacle. The tickets for the marquee sporting event will go live soon and will available on Paytm. About Premier Futsal Management Pvt Ltd.
Premier Futsal Management Pvt Ltd is the world’s biggest futsal promotions company, and the controlling entity of Premier Futsal, the flagship 3-week event comprising of ex-football superstars, the best futsal players in the world and home-grown amateur players scouted through a talent hunt.It is now the most viewed futsal event in the world. The company comprises President, Mr.Luis Figo, former 2-time World Player of the Year and Real Madrid legend; Vice- President, Mr.Alessandro Rosa Viera (a.k.a Falcao), better known as the “Pele of Futsal” ; and an investor consortium led by Mr.Britto, Chairman, Premier Futsal and Kerry Indev Logistics and Mrs.Vimala Britto, Vice Chairman, Premier Futsal and Chairperson, St.Britto’s Group of Institutions & Seek Foundation. Premier Futsal has been conceptualised by 3 young Indian entrepreneurs Mr. Dinesh Raj (MD), Mr. Abhinandan Balasubramanian (CEO) and Ms. Nithyashree Subban (CFO), who conceived this platform with a passion to popularize futsal and support the government’s exemplary efforts to build a sporting ecosystem.